The snow was high. It was at least up to my knees, and the fluffy powder fell into my boots, which were fastened with an elastic band around a button. My ankles were cold but stayed dry thanks to the old bread bags I had pulled over my feet. The bags served two purposes; to keep my feet stay dry and to help my feet slide into the tight rubber boots in the first place. I trudged through the fresh snow, forging a path. I saw the perfect stick, sticking up out of the snow, and I wanted it. I could drag it along behind me creating stick-thin trails, or whack a snow-covered fence, or poke holes in the snow…that stick held so many possibilities! The tamarack tree was smack dab in the middle of our yard. As it grew, its green branches became a perfect canopy to play under. Ladybugs crawled on its truck. In an upside-down cone shape, red fuzzy seeds grew up to the sky. In the fall, the green canopy changed to a brilliant red. My family valued this tree, even though it is quite common in Central Illinois. It grows in large groves at the edges of farm fields, and its distinctive red berries are easy to spot. Years after moving away from our yard and our tamarack tree, I decided to write a nostalgic blog post about it. Searches for images, however, showed me a tree that was nothing like the one we had in our yard. It became clear that a tamarack tree was nothing like the short little tree that I had played underneath. It so happened that during our family vacation that summer, we saw many of these short trees growing by Niagara Falls in New York. I took a photo, hoping to discover what these plants are called. Just this fall, I began reading Little House in the Big Woods to my daughter Emmy. I read the following passages to her, and knew I had my answer, not through my own online searches, but in a children’s book. The days were growing shorter and the nights were cooler. One night Jack Frost passed by, and in the morning there were bright colors here and there among the green leaves of the Big Woods. Then all the leaves stopped being green. They were yellow and scarlet and crimson and golden and brown. Along the rail fence the sumac held up its dark red cones of berries above bright flame-colored leaves. Acorns were falling from the oaks, and Laura and Mary made little acorn cups and saucers for the playhouses. Walnuts and hickory nuts were dropping to the ground in the Big Woods, and squirrels were scampering busily everywhere, gathering their winter’s store of nuts and hiding them away in hollow trees. 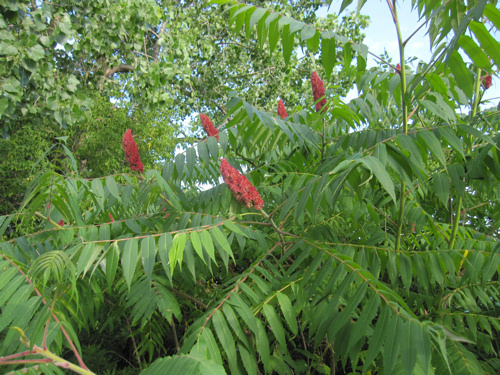 Memories of our “tamarack tree,” or our Staghorn Sumac as I now know it to be, are so clear in my mind. Last winter a stick stuck straight up out of the snow, in front of our house. Remembering my own attempt to pull a tree out of the snow, I told my daughters not to pull on the Rose of Sharon bush I had transplanted in that spot. “We know, Mom!” they both exclaimed. Clearly, they have more sense than their mother. ← What is this plant? Ah, lucky you to be reading the Little House series to your kiddos. I've read all of them aloud to my boys I'd guess five or six times and they only grow deeper and more interesting on multiple readings, especially The Long Winter. Wonderful post! I love sumac! It is so beautiful, especially in the fall. This post is so evocative. Loved this post! It reminded me so much of my own childhood: breadbags worn under boots and Laura Ingalls Wilder…great memories! A lovely story. I love the fact that you put bags on your feet. I love the Little House on the Prairie series. I can't wait until my daughter is old enough for me to read it to her. Such a wonderful reminder of the childhood memories we all cherish… especially around the holiday season! Isn't crazy how much "smarter" our kids are, then we were back in the day?? Laura Ingalls Wilder was my fave growing up as a kid. My son is 7 and he's read several of the books now, which thrills me to no end. I would not have recognized that as a sumac tree, though. I'm not great with tree recognition, LOL! I love figuring out what plants are what! I brought back a plant from my Stepmom's house in Alabama many years ago. To this day we call it Audrey II after Little Shop of Horrors because we can't figure out what it is and because it grows so fast! Great post! Oh, that is so funny! I love Little Shop of Horrors! This is good! 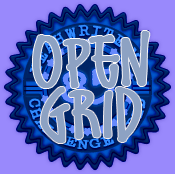 Why don't you put it on the grid? It's open again! Don't be intimidated! It may seem that it's a hard group to crack, but it's not. We love encouraging and supporting others — I promise! I became a Yeah Write addict in May (I think) and have learned so darn much from reading others' posts. It's kind of like getting a degree in creative writing without the tuition, LOL! There are some writers whose posts are so good I drool and think "Only in my dreams can I write like that!" but I prefer to think of them as inspiring rather than intimidating. And, this is a note from the comment you left on my blog, it is Studio 30+ — that + is very important — anyone any age over 30 is encouraged and welcomed to join. I haven't spent as much time there as I have with Yeah Write, but there are a bunch of us who are members of both sites. Oh! That's what I get for reading to quickly–I miss those important details! Thanks for letting me know…I'll definitely check out Studio 30+ again! And thanks for encouraging me to be part of Yeah Write…I may even try to join a moderated grid..YIKES! Aw! I love this post! (I even love that you tried to pull a tree out of the ground when you were little). My recent post We’re Going to Give It Up Mommyland—The Dose of Reality Style! Thank you! I wonder if my dad even remembers that? I'll have to ask him! What a wonderful way to discover the name of it! I love this story! It made me smile when you mentioned the bread bags in the boots. I used to do the same thing as a kid! I was wondering if those bread bags would bring back memories for someone else! I'm glad you entered this in the yeah write challenge. I was wondering if you would! 🙂 I saw that! I grew up with it, too. That's how I knew. Don't think I ever heard it called Tamarack, though. That's because we were completely wrong! LOL! LOL Well, you can't be right all the time, I guess. 🙂 Glad you know what it is now.